Even if I’d been surrounded by competitive sport as a child, isn’t there a chance I’d still have disliked it? Perhaps my nature, or something in my environment, or a combination of both, might have led me to reject it. Similarly, with children who don’t like to read, isn’t there a chance they are just not that into it? It’s a logical conclusion. But reading is so important to a child’s education, I believe we owe it to our kids to do everything in our power to turn them on to reading. So how can we rev up reluctant readers? Give these ideas a try. Make sure there all sorts of printed materials in your home, and in places that are available to your kids. Leather-bound classics on high shelves do not work. Fiction, non-fiction, poetry, plays, picture books, chapter books, caption books, comic books, library books, dictionaries, encyclopedias, board books, books with audio tapes, home-made books, joke books, text books - you never know when a particular format or genre will appeal to your child. I am old-fashioned enough to believe we cannot always get to choose. There are somethings in life we just must do, like stop at red lights. Unfortunately, that can apply to reading, particularly at school. But if you want reading to be associated with fun, with enjoyment, then allowing your child to choose his own reading material for home is a great idea. If you're at the library, and you think a book is too difficult, I think it's better to let your child find that out for himself, than make the choice for him. Same goes at book stores, garage sales etc - a little gentle guidance doesn't go astray, but it comes down to balance. Encouraging kids to make choices gives them a feeling of independence, teaches them consequences and allows them to have a measure of control in their lives. If you only ever read when your kids are asleep, they don't get to see you as someone who values reading because you enjoy it yourself. Boys in particular need to see that reading is a significant and valuable activity for their dads. Youngsters copy what they see adults do. Sometimes kids associate reading with a bad experience. Maybe someone has belittled their reading ability, or it has become a dreary chore for them, struggling with unsuitable material. In some cases, I advocate backing right off. Don't abandon a daily reading schedule - but change it. Consider different approaches. Could you share the reading? By that, I mean read aloud together. No correcting so that removes the whole 'right/wrong' attitude, and it becomes two people making meaning from print. Could you read most of the book aloud, and just ask your reluctant reader to join in at certain places? Work on reinforcing what he does know, and slowly introduce new material. Reading can be such fun - try to find material your child will enjoy, and read to him or with him. Maybe it's a review of a movie he might like, or a book starring his favourite toy. Find the key that will rev him onto reading. This is linked to several points above, but can't be emphasized too much. Read aloud snippets from the newspaper, a riddle, a great line from a poem, an interesting snippet from a magazine. Read aloud to your children at least once a day, and do your very best to make your performance entertaining. If we surround kids with all different kinds of print, give them choices, model reading to them, share the fun of reading, make reading aloud a daily habit at the very least - and they still don't like to read, well, we've done our very best. And in the end, that's all a parent can do. That is such a great photo. It reminds me of myself as a child. 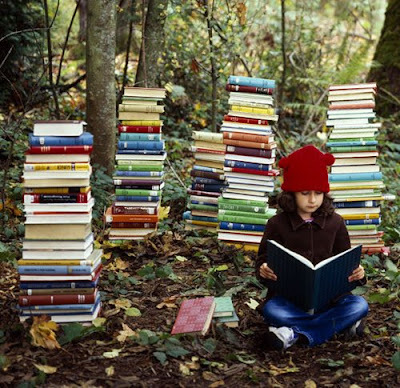 I was always taking a couple of books, and climbing a tree, and reading there for hours. Talk about privacy, and uninterupted reading time. I agree that sometimes there are children who just don't care for reading, especially as entertainment. I haven't had this problem with any of my children yet, but it is always a possibility. Out of my five siblings and I, only two of us really liked to read. You have some great suggestions for encouraging interst, though. I think much of the time children who have difficulty reading are the ones who don't enjoy it. Just as those, like myself, who are allergic to balls don't care so much for competitive sports. Author James Patterson has a ten year-old son who doesn’t like to read. So Patterson has established http://www.readkiddoread.com to help other reluctant readers. I, too, grew up as a reluctant reader. And my father was the author of over 70 books. Now I write action-adventure and mystery books especially for tween boys. My blog, Books for boys, http://booksandboys.blogspot.com is # 4 on Google today. I agree, Lisa. When something is difficult, it's hard to like. I just think we should give our kids every chance of loving reading by providing the optimal conditions. In your case, that would mean a tree as well! There are some great articles and recommendations for books on both sites, thanks Max. So many boys love action and adventure in books and movies. The Maximum Ride books almost leave me breathless! Excellent post. I think you hit all of the major points. My mom was a children's librarian in her first career (as was I), and we were surrounded by books. However, when I was 6 years old, she said, "I'm afraid Farida will never be a reader." I had gone into first grade thinking that I already knew how to read, and when I realized that I had simply memorized all of the picture-books in the house, I lost interest in the slight books we had to read for first grade book reports. That summer, left to my own devices (i.e. no book reports) but still surrounded by books, the reading breakthrough began. Thanks for sharing a little of your journey, Farida. Unfortunately, it seems to me that some education systems require things certain to turn kids off reading. I'm so glad you had the breakthrough and went on to become a Storyteller. I love Saints and Spinners! Great post and much easier to comment today. Thanks for trying again, Shelly! Wonderful post - wonderful ideas! Thanks, Sally and Katie. I love this CommentLuv feature where I get to see your last blog post and visit it. Those are good reminders for parents. I've been debating whether I should go back to reading aloud to my reluctant reader. She is 12 years old, and part of me thinks that reading aloud would be babying her. She is just such a slow reader that she gets bored and discouraged before a book can grab her attention. The only exception is graphic novels, but those are generally frowned upon by our school system. Great points, Susan. I especially agree with the one about setting an example, kids just want to do what their parents do. And let us not forget about one of the most important ones, TURN OFF THE TV. While it's not realistic to remove it altogether, as long as it's on, no reading will get done. Thanks for your insight and have a nice day. Good point, Fred. Too much screen time certainly fries my brains, but I am more of a mouse potato! I'm a great believer in a fixed reading routine, as well as reading whenever a child wants. But a time set aside, say before bed, when only reading is allowed, be it listening to reading or reading alone, has huge benefits and becomes a great habit.